If it seems like immigration concerns have been in the news a lot lately, you aren’t wrong. Since the last presidential election, and the lead-up to it, immigration has been an issue of major concern to politicians and the American people. 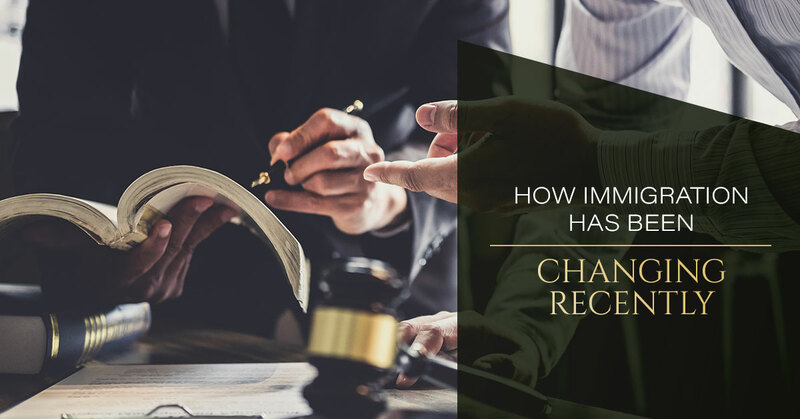 As we reach the midpoint of the current presidential administration, it has become apparent that immigration law is going to continue to be a spotlight topic — and that key changes are occurring. Here’s what you need to know about how immigration has changed (and is changing) during the current presidential administration. Immigration reform was one of the key stances the President spoke about throughout his campaign for office. In that vein, it makes perfect sense that one of his early acts in office was to enact a travel ban that focused on Muslim-majority countries — specifcially, Yemen, Libya, Somalia, Syria, and Iran. This wasn’t an immigration-specific policy, necessarily, but it did have the effect of seriously curtailing arrivals from those countries, even when the travel ban was being disputed in the Supreme Court. In the roughly two years since the travel ban was initiated, the country is on track to see the rate of legal immigrants coming from Muslim-majority countries fall by nearly a third. The President’s travel ban isn’t the only thing changing immigration. Several countries not affected by the travel ban have seen a drop in numbers, as well. In the last two years, the U.S. has seen a drop in the number of immigrants being granted visas to people from China, India, Vietnam, the Philippines, Bangladesh, Pakistan, Afghanistan, Haiti, Jamaica, the Dominican Republic, and Mexico — all countries that we have typically had the largest number of immigrant visas granted. From the top ten countries the U.S. grants immigration visas, El Salvador is the only country that will see an increase under the current administration. In addition, visas approved for immigrants of African nations has fallen by roughly 15 percent. Immigrant visas granted to people from European countries have risen slightly, but the U.S. issues far fewer visas to European nationals to begin with. The current administration’s stance on immigration may play a big role in how many individuals are applying for immigrant visas. That’s understandable. After all, there are many who would find the anti-immigrant rhetoric a deterrent. It would feel like the policy equivalent of pulling in the welcome mat and slamming the door shut. While official policy isn’t discriminatory, some of the President’s comments about immigrants and remarks about certain countries implies otherwise. The other side of the coin, of course, is how long the process takes. Currently, there’s a backlog of more than 800,000 immigration cases waiting to be heard. That backlog has nearly doubled in the two years since the president took office. Part of the reason the backlog has grown so large is because of the lack of funding available to pay for immigration judges to hear cases. As of now, immigration hearings are scheduled out as far as 2021 in some areas. The wait time and uncertainty may be enough to have some individuals rethinking applying for an immigrant visa. Not only is the current administration processing and approving fewer immigration applications, but they are also making moves to restrict the types of visas available — which would further restrict how potential immigrants could apply to enter the U.S. legally. The administration has backed multiple bills that would have eliminated some types of immigration visas if they had been voted in by the Senate and Congress. This has led, at least in part, to many more individuals applying for immigration visas now out of fear that those visas will soon disappear. The other major ending we’ve seen during the current administration is that of Deferred Action for Childhood Arrivals, or D.A.C.A. This program provides some level of protection for immigrants who came to the U.S. as children while they apply for permanent immigration status as adults. The current administration has pushed for the end of D.A.C.A. and has yet to come up with a policy to replace it with different measures. The Dreamers who have been waiting for immigration hearings and visas now face an end to the policy and no route through which they can remain in the U.S. while they seek alternatives. With so many policy changes, it can be difficult to keep track of everything happening in regards to immigration. If you seek immigration to the U.S., or you have a loved one who does, the best option is to work with an experienced immigration lawyer. Whether you seek asylum or you’re working on a Green Card application, the team at Zohar Law can help. We have the knowledge and years of experience to work with you and guide you through the immigration process. Connect with our office to schedule a consultation and work with an immigration lawyer today.